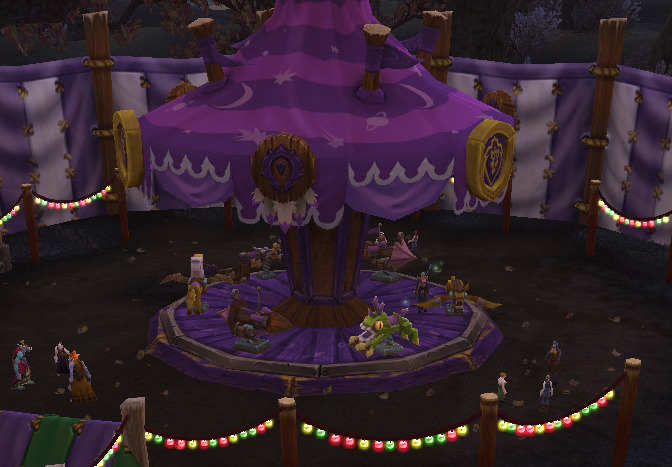 This buff can only be gained while the Darkmoon Faire is active. To get it, visit the island and purchase a Ride Ticket Book sold by Kae Ti, the NPC right outside the attraction. Open your ticket book to receive your Darkmoon Ride Tickets. Having these tickets will allow you to ride on the carousel (which functions like a vehicle). 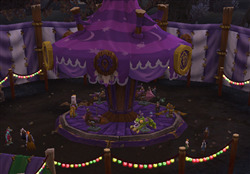 If you do not have a Darkmoon Ride Ticket in your inventory, you will be teleported out of the ride area and back to the main walkway. The duration of the buff increases the longer you ride, capping out at one hour. The buff does not persist through death.